Can't wait to see her in her new dress of fresh snow! It's Sunday, the sun is shining and there is fresh snow on our two volcanoes! Grabbing cameras, a picnic lunch, and breaking loose! No painting today! Orders from the boss (as if...but he loves it when I call him that). Mt. 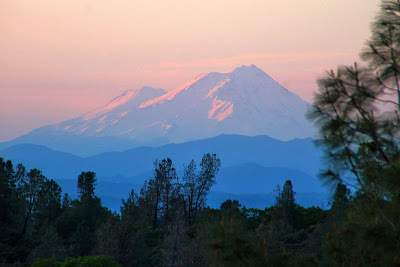 Shasta is beautiful all the time but especially on a clear day with fresh snow! Adios Amigos. Getting out of Dodge! Last year's photos. Yesterday's weren't as dramatic, but it was fun getting out. Thank you. It always helps when the model is gorgeous! Sounds great! I hope you had a wonderful day. Very peaceful day. Beautiful scenery and incredibly nice weather. That is a wonderful picture. I hope you enjoyed your day. It was great. Perfect drive! Cascade Range is supposedly much younger than the Smoky Mountains, or any of the Appalachian Range. Not as worn down so seems more jagged. Mt. 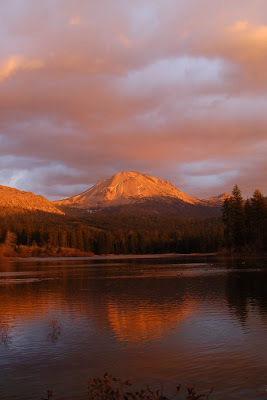 Lassen is more than 10,000 feet and Mt. Shasta is 14,000+ feet above sea level. Both Beautiful mountains. I've always dreamed of visiting the Smoky Mountains.